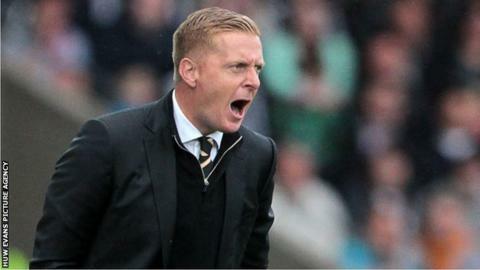 Mark Gower says Swansea City will be making a "horrendous mistake" if they sack manager Garry Monk. Gower played 123 games for the Swans alongside Monk between 2008 and 2013. His comments follow reports that Monk is set to be dismissed after Swansea's 1-0 defeat at Norwich saw them drop to 14th in the Premier League. "If they were actually to pull the trigger and get rid of him it would be a horrendous mistake, and I would be shocked," said Gower. "But I'm not shocked at the speculation because that's the kind of world we live in at the moment. "It's a cut-throat business and it seems that if a manager in the top flight has a series of dodgy results on the spin then speculation about his his job comes with the territory." Monk is expected to be given time to turn things around and will be in charge when Swansea play Bournemouth on 21 November. Under Monk's guidance Swansea City finished eighth in the Premier League last season with a club record points total of 56. And they made a promising start this season - drawing with Chelsea and beating Manchester United in August. But since then, Swansea have only beaten Aston Villa in the League, with reports suggesting chairman Huw Jenkins had spoken to Monk about appointing a director of football to assist in the running of the side. Gower believes that may have soured relations between Monk and Jenkins. "Garry and the chairman have always had a good relationship even as a player and now as a manager, and he's always spoken highly of the chairman and his support and I hope that continues," added Gower. "Obviously Garry's not been too happy regarding bringing someone in and that I can understand because he dedicates his life to the job and he trusts himself and up until now the chairman has trusted him as well. "They need to clear the air a bit maybe over the international period just maybe set a few things straight and get back to them all going in the same direction and carry on from there." Former midfielder Gower believes the new Premier League funding deal, which starts next season, is an added pressure on managers. From 2016-17, the team that finished last in the Premier League will be guaranteed £99m, with the champions to pick up £150m. It means any club relegated next summer will miss out on a huge financial package. "Possibly this year with the TV money coming in next year maybe people a panicking a bit more than perhaps they should," said Gower. "But he's got experience of being in dips, and hopefully he can get out of this one. "A result here and a couple of points on the board there and things will turn around I'm sure. "He just needs to be given the support he deserves and hopefully he can turn it around."